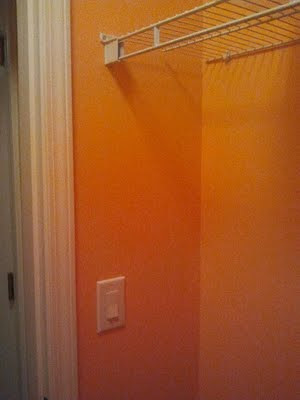 Buford Betty: Orange you glad we finally painted the closet? 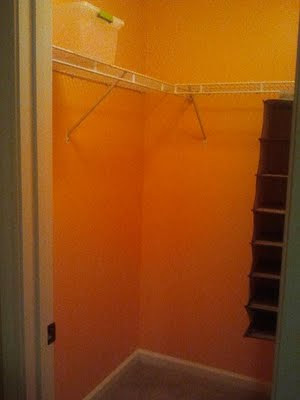 Orange you glad we finally painted the closet? Oh yeah, it is ALL orange, ceiling included. It's wise to put on some shades before entering. Once we get things more situated, I'll definitely get some better pics up, but for now I'm being lazy and using camera phone pics, so excuse the poor quality. For literally, spare change! Love it! Love the color! Our bathroom is that color and when we first moved in, everyone asked, "Did the previous owners do that?" and I was like, "Nope, I did!" For some reason orange just really appealed to me and it came out great! We find out in a few hours whether we're pink or blue. Actually what I'm more excited about is whether we're princess monkeys or non-princess monkeys! 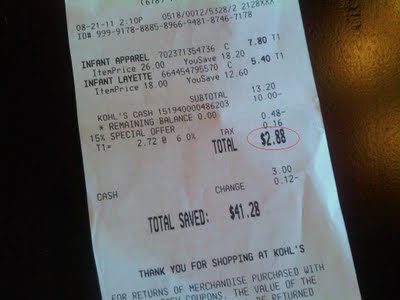 Love the stuff you picked up at Kohls! Oh I love how bright and cheery that color makes the closet! 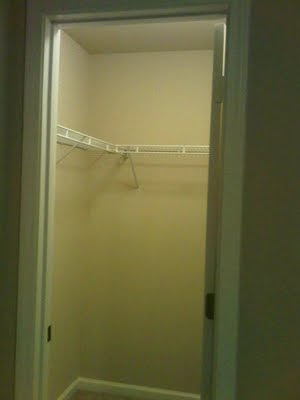 Can't wait to see how you set up the closet. 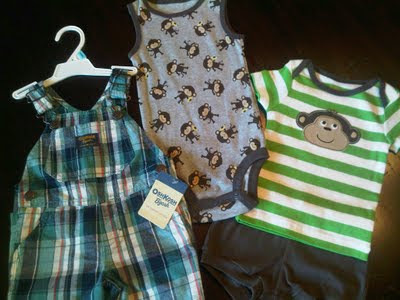 Our nursery-to-be has a tiny closet so it will take some creative ideas to make it organized. Love the clothes you picked up! They just sent you a gift card? Why? 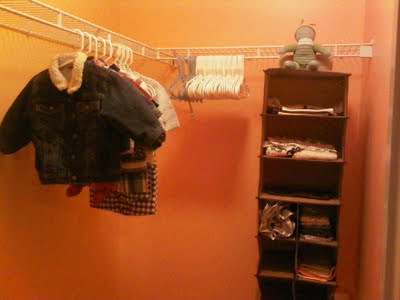 Nursery Closet: The Finished Product! Checking things off my list! Some goodies for our boy! Welcome to my crib, yo.